Pavement maintenance contractors are not the only people who understand the importance of aesthetically pleasing and well-preserved pavement. Municipal/government management, property managers, business people and visiting customers, and the general public know it as well. It is, however, usually only the contractor who understands that the best way to maintain pavement is with an effective pavement maintenance plan. Pavement maintenance plans can vary in scope, but they never vary in their purpose: to increase pavement life. A proper pavement maintenance program includes crack filling, pothole repair, sealcoating, and many other surface applications, depending on the condition of the pavement. It should also include sweeping and periodic line striping. To understand how sealcoating works, it is necessary to understand the nature of the asphalt pavement itself. Because of its excellent waterproofing, flexibility, and adhesive properties to bind and hold the aggregates in the pavement, asphalt has been used extensively for paving and road construction. Prior to the advent of asphalt as a paving material, roads were constructed by spreading graded aggregates over a roadbed. These roads worked well as long as the stones remained in place and stayed dry. Naturally, these roads needed constant repair – stone would shift under the traffic and the road’s load carrying capacity was severely damaged when it rained. The stone would absorb water, swell and lose its strength. But spraying asphalt on the surface overcame this problem somewhat. Asphalt paving technology gradually evolved and today the vast majority of roads and parking lots are constructed using asphalt as the binding material for the aggregates. Due to its waterproofing properties, asphalt protects the aggregates from absorbing water, thus preserving their strength and load carrying capacities. Today’s asphalt pavement is a mixture of stone aggregate and mineral filler combined with a small amount of asphaltic binder (asphalt cement). The strength of an asphalt pavement is directly related to the pavement design from the ground up. The asphalt pavement people see is only the “roof,” so to speak, of the entire pavement. This “roof” covers a bed of graded stone aggregates of varying depths according to ground conditions as well as traffic requirements. This base of aggregate is what really carries the load of the traffic. A firm resilient surface that provides a roof over the stone base will keep the pavement bed dry. It is important to have an elastic characteristic in this pavement so that it can expand and contract and still remain intact. Why seal asphalt? In spite of its excellent adhesive and waterproofing properties, asphalt has some serious drawbacks that relate to its chemical makeup. Asphalt is a very complex mixture of thousands of chemicals with a considerable degree of instauration within their molecular structure. This characteristic provides easy access to weather, salts, and chemicals to attack and disintegrate the asphaltic molecules. As the asphaltic molecules disintegrate, the asphalt in the pavement loses much of its original properties, such as binding and waterproofing. The first visual sign of this phenomenon is a progressive change in the color of asphalt pavement from rich black to brown to gray. Furthermore, other products that also are derived from petroleum – such as oils and fuels, fats, grease, mineral spirits etc – easily dissolve asphalt. As petroleum, or as byproducts of the petroleum distillation process, these various products existed together for millions of years. It is only through the petroleum refining process that they are separated for various uses. Because these individual products come from the same source, they have a natural affinity for one another and when put in contact with each other will try to join together again. So, for example, when automotive oil or gasoline drops onto an asphalt pavement, they will work to easily dissolve the similar chemicals in asphalt. These problems are associated primarily with off street or roads that carry very low levels of traffic. Busy roads, having the advantage of continuously rolling traffic, do not need protection because the rolling action of the traffic steadily brings the lower layers, rich in asphalt, to the surface and “kneads” the oxidized surface layers back into the pavement. Eventually all the asphalt binder is exhausted and the aggregates begin to unravel. This happens to all pavement, including roads. The rate of pavement deterioration depends upon the traffic volume as well as climatic conditions. The next step is the development of minor cracks that widen and deepen with time. If the cracks are not repaired at this stage, water seeps into the base courses and damages the pavement’s load bearing capacity. Rutting, shifting, and serious alligatoring evidence this. The pavement then must be either overlaid or completely removed and reinstalled, depending on the condition. Lightly traveled roads and off street pavements do not have the advantage of this “kneading” action. The surface layers of these pavements are under continuous attack from the weather and other destructive elements, eventually developing minor surface cracks. Again, aggregates start unraveling producing minor cracks that widen and deepen with time. The damage will continue if proper protective actions are not taken. It would be logical to conclude that lightly traveled roads and off street pavements can be preserved by a “protective coating” that resists attack by the elements that destroy the asphalt in the first place. • Beautification - Fresh sealcoat brings a dark black color to the pavement, making it look and wear like new. A black parking lot has a clean, rich look that presents a positive image of the company, facility, or residential complex. Striping also enhances the beauty of a newly seal-coated parking lot. • Slows oxidation and water penetration - Exposure to oxygen hardens asphalt binders and results in a brittle pavement surface that soon cracks. These cracks permit water to penetrate into the sub base, weakening it and reducing pavement strength. This in turn leads to more cracks, which can eventually expand and become potholes. Sealcoats fill surface voids, reducing exposure to oxygen and water and prolonging pavement life. • Resists gas and oil spills - Gasoline or oil leaking from an engine can soften asphalt. Because coal tars aren’t soluble in gas or oil, coal tar sealers prevent this damage. And manufacturers of asphalt emulsion sealers usually add polymers to increase the resistance to gas or oil. By filling surface voids, sealing reduces the depth to which oil or gas can penetrate. • Resists ultraviolet rays - Ultraviolet rays from the sun break the links between carbon bonds within asphalt. Sealcoat does not repair any damage that has already occurred to the asphalt, but it does prevent ultraviolet rays from further damaging the asphalt pavement. • Easier to clean and maintain. Sealcoats fill surface voids while coating the pavement surface, The resulting smooth and even texture makes surfaces easier to maintain year-round — snow is easier to remove from a smooth surface, and sweeping is more effective on a smooth surface. • Increased pavement flexibility - A sealcoat keeps a parking lot black. The blacker it is, the more heat it draws from the sun; the more heat it draws, the more pliable it is, the more able it is to withstand traffic volume changes without cracking. • Cost-effective in the long run - The price of asphalt concrete will always be affected by crude oil prices, which fluctuate when supplies vary. It’s less expensive to sealcoat a parking lot every couple of years using a coal tar or asphalt emulsion than it is to overlay or place a new lot. Surface preparation: Proper sealing starts with good surface preparation. New asphalt must be completely cured before any sealcoat can be applied. If applied too soon (some manufacturers say less than 30 days is too soon), coal tar sealer might entrap asphalt volatiles at the asphalt/coal tar interface, softening the surface below the sealcoat. The sealcoat might flake and peel off, or tracking might result. Volatiles in new asphalt will also slow the curing of asphalt emulsion sealers if they’re applied too soon. The sealer then might wear off prematurely. Old asphalt pavements might contain small (up to 3/8 in. wide) or large cracks and oil spots. Small cracks should be cleaned, large cracks filled with a crack sealant, and oil spots removed or treated with an oil spot primer to increase adhesion. Areas with numerous cracks or alligator cracking might need to be removed or replaced. These surfaces also might contain depressions, which will need to be brought up to grade with hot mix asphalt that’s allowed to cure. Once these repairs are completed, all surface dirt and debris needs to be removed. This can be accomplished with a hand broom, power broom, or power blower. Dirt reduces the bond between the sealcoat and the pavement. The sealer will adhere to the dirt…but the dirt won’t adhere to the pavment. In addition, old pavement that’s extremely dry (light gray in color) or that has exposed aggregate might need to be primed to improve sealcoat adhesion. The primer, a slow-setting emulsion (SSI-H) should be diluted with five parts clean water to one part emulsion and applied with brush or spray at a rate of approximately 1 gallon per 100 sq. ft. 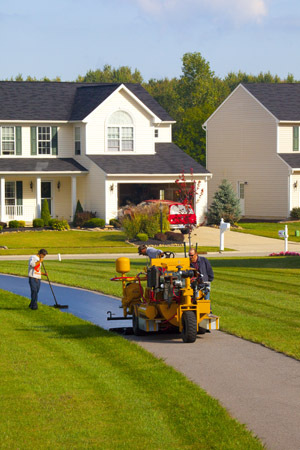 If weather conditions don’t allow for a complete settling of surface dust or if the air temperature is above 90°F, a contractor might need to treat the asphalt surface with a fine mist of water before applying the sealer. The mist should dampen the surface but leave no puddles or visible water. This improves adhesion by preventing the emulsion from breaking or curing too fast. Also, sealcoating should only be performed under the proper weather conditions. Manufacturers recommend air and pavement temperatures be at least 50°F during sealer application and for at least eight hours afterward. The Importance of Proper mix design: A quality seal coating job requires a quality material with a quality mix design. You can do all of the cleaning, crack filling, and preparation, but if the sealer in the tank is not up to manufacturer specification, you will not have the best result. Seal coat can be purchased in one of two ways – as a Concentrate or Ready to Use (RTU). Using RTU can help eliminate the chance of a failed mix design and saves time. When concentrated sealer is being used, manufacturers recommend the use of water, additives, and aggregate. It is important to read material specifications and to ask your manufacture or distributor for proper mix designs to ensure proper dilution. Proper water dilution is necessary for concentrates – add too little water and the material will be too thick and heavy for proper coverage, possibly causing the sealer not cure properly. Power steering marks and tracking are common problems. Too much water and you can have adhesion difficulties – rendering the coal tar or asphalt binder ineffective, not allowing it to bind to the pavement. If the coal tar or asphalt in the seal coat is diluted too much, the sealer can flake off, or the aggregate will roll out of the material. Proper water dilution is also imperative for coverage rate. Always use the specified amount of additive in your seal coat. It may add a little cost, but it can prevent a whole lot of painful complaints when you use them. The last, and believe it or not, one of the most important parts of mix design is the aggregate. Aggregate has several different attributes that contribute to the quality of the sealcoat job – type of material, size, weight, color, and shape. Most seal coating contractors use sand as an aggregate, some like a boiler slag because it’s black, helping to hide the wear marks of the seal coat. Other minerals can be used but these two are the most common. The shape of the aggregate is important, if the aggregate is too round, the seal coating may not bind well and it can roll out of the sealer. If it’s too large, it may be too heavy and not suspend well in your application tank, it will also have a tendency to roll out of the sealer. Always follow the manufacturer’s recommendation on size (per gradation) and amount. Too little aggregate may cause slip hazards, premature wear, and add to drying times. Too much aggregate can cause your tank and filters to lock up, and also cause the seal coat to not bind fully to the asphalt. Application: Most sealcoating applications require two coats of sealer; home driveways usually receive one coat. Three coats are recommended only for surfaces that experience continuous traffic, such as drive-through lanes at restaurants and banks. • First Coat. A contractor uses a squeegee, brush, spray wand, or distributor truck to place material in continuous parallel strips over the entire pavement surface. To eliminate all ridges and air pockets, a worker then spreads the sealer uniformly across the whole surface, including hard-to-reach areas near parking curbs. • Second Coat. The surface of the first coat must be clean before a second coat can be applied. Loose dirt can be blown off or swept off; hardened dirt or mud should be scrubbed off with a little water and rotating brush. The second coat should be of the same consistency as the first coat and can be applied in a like manner [Some contractors do prefer to squeegee-apply a first coat and spray-apply a second coat.] To enhance bonding between both coats, the second should be applied at right angles to the first. After the second coat is applied, the area should be blocked off to ensure a thorough curing of both sealcoats. In Summary: A sealcoat consists of either refined coal tar pitch (derived from coke, a byproduct of the steel production process) or asphalt cement, (a byproduct of the petroleum-refining process) mixed with inert fillers, water, emulsifying agents, or additives. Applied in thin coats, this surface treatment is used to protect off-highway asphalt pavement surfaces such as lightly traveled roads, parking lots, driveways, runways, service stations, and heliports. However, a sealcoat, like all pavement maintenance repairs, is a temporary means of inhibiting pavement deterioration and needs to be applied on a regular basis - about every three - five years. • Preserves asphalt for pennies per square foot.